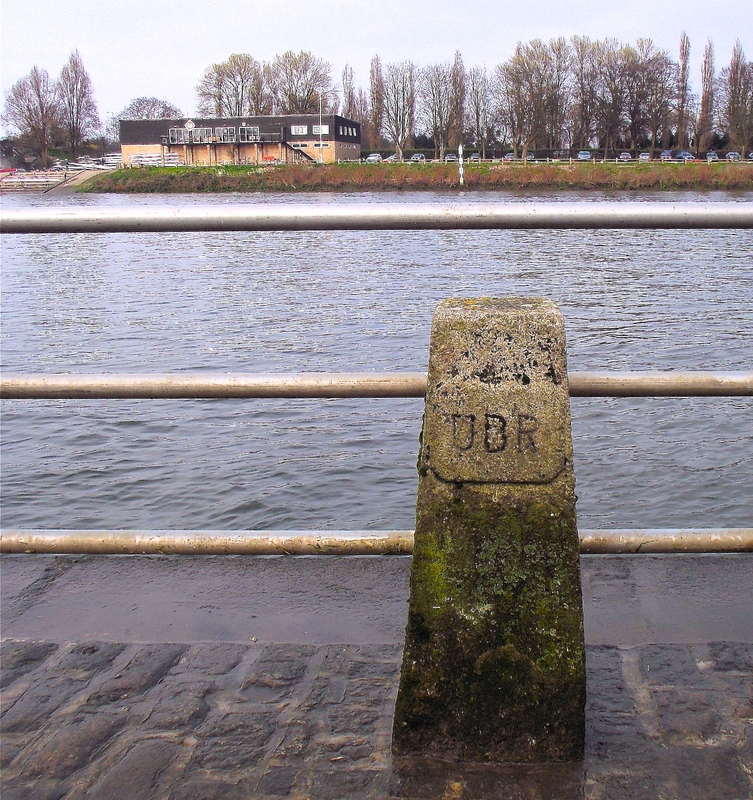 University Stone and the University Post, just downstream of Chiswick Bridge. This is the finish point for the Oxford-Cambridge Boat Race and the start point for all the Tideway head races. 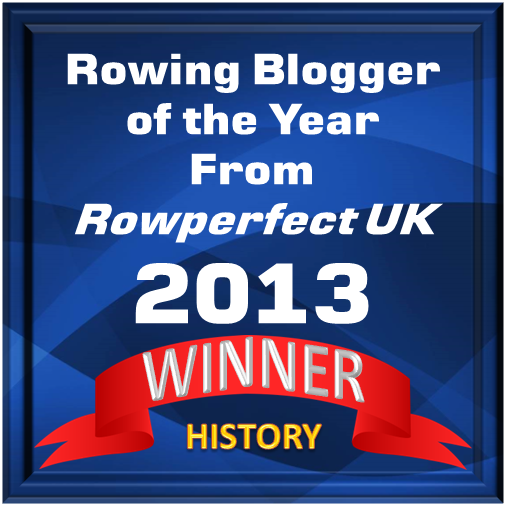 Daniel Walker has been in and around rowing since he was a schoolboy in Norwich in the 1980s. He is a British Rowing National Umpire, the Chief Marshal for Hammersmith Head and a member of Auriol Kensington Rowing Club and Leander Club. Due to modesty or forgetfulness, Daniel omitted to mention that in 1989, he won Henley’s Thames Challenge Cup with a University of London crew. Hammersmith Head Division 4 marshals above Chiswick Bridge. On the right are Mortlake Anglian and Alpha Boat Club (which is one club) and Quintin Boat Club. The Oxford-Cambridge crews go in here at the end of the Boat Race. Hammersmith Head has traditionally been two races – one ‘Open’ and one for Women and Juniors – run two weeks apart on a course starting at the University Post by Chiswick Bridge and running downstream to the finish by Hammersmith Bridge. 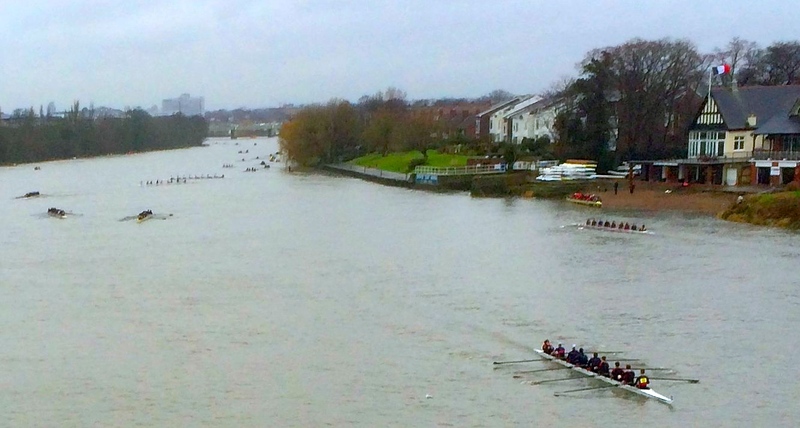 This makes it one of the shorter head races to run on the Tideway, the traditional Championship course continuing a further one and a half miles to finish in Putney. Nevertheless, it has long been a popular warm-up event, running as it does just a few weeks before the three major Tideway Heads – the Head of the River Race, the Women’s Head of the River Race and the Schools Head of the River. In 2013, my second year as Chief Marshal, an inconvenient calendar and the unrelenting tide timetable meant that it was not possible to run both events at reasonable times and so they were combined into a single race. This brought both challenges and some simplifications to the event. With just one race to run, it was slightly easier to find the many volunteers we needed. Each day we need more than 20 launches and launch drivers, perhaps 30 umpires/marshals, eight or more people for the timing and many other helpers. Combining the events meant we had a much bigger event on our hands and from 110 crews in each race we jumped to more than 200 in a single race. An event with this many crews requires an official river closure and so for a few hours the Thames is closed to all but race traffic. It also meant we needed even more volunteers – but fortunately not twice as many. Notwithstanding the challenges, we decided that the larger race gave us more flexibility and we have run as a single event ever since. Last year and this, we have limited the entries to 250, but plan to increase to around 300 in 2017. November 2015: with just under 100 days to go, the Annual General Meeting of Hammersmith Head of the River marks the start of planning for the 2016 race. In truth, this mainly consists of dusting off last year’s plan and checking whether anything needs to change. The course is 2 ¾ miles from Chiswick Bridge to Hammersmith Bridge. The only significant changes this year are the decision to buoy a short section of the course at the finish in order to help manage returning crews and to slightly change where crews will turn after they have finished. The day after Christmas 2015: exactly eight weeks before race day, the Chief Umpire sends the invitations for umpires and marshals to assist with the event. As stated, we need six dedicated safety launches, two first aid/paramedic teams, around 30 volunteer umpires with more than 20 launches and drivers to get them on the water and, in addition, we will need four to six people to run the timing team and perhaps another ten for overall event administration. 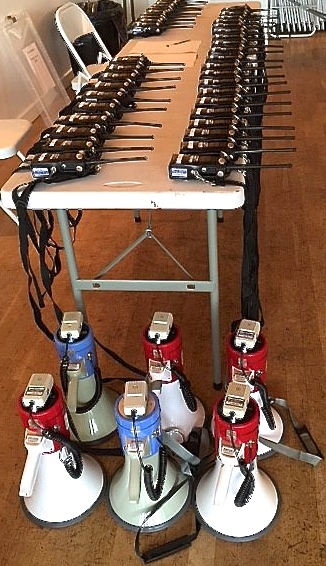 Some of the communication equipment needed to cover three miles of river. New Year 2016: with 50 days to go, the event is made live on the British Rowing Online Entries system and clubs can start to enter their crews. This year we had a self-imposed limit of 250 entries, a mixture of eights, octuples, four and quads. 11 January: forty days remain and the first regular committee meeting is held. At this point, we aim to have all the event documentation complete for submission to the Port of London Authority (PLA). This includes all safety documentation including instructions to competitors, the marshalling plan and the abandonment plan. Twelve days are left on 8 February and the final full committee meeting takes place – we’re all set! In the last week, the Chief Umpire and I meet to finalise the marshal assignments. Unfortunately, the calendar means that race day has landed on the school half term break and, as a result, many of our regular marshals are unavailable. In the last few days, the Safety Advisor monitors the weather and river conditions very carefully. Clearly it is mid-winter and the weather is not likely to be very pleasant, and we are very concerned about the wind, both strength and direction. The course runs approximately from West to East and the prevailing wind direction is Westerly. More or less any wind direction from Southerly to Westerly is fine as long as it isn’t too strong. Overall the weather forecast looks good, cold and breezy but really quite acceptable for a London winter day. Hammersmith Bridge, the finish point for the Hammersmith Head. On the morning of race day, we have a problem, the Port of London Authority’s tidal flow flag system has been Green for the whole week but today has switched to Yellow, meaning “Ebb tide Strong Fluvial Flows”. Hammersmith Head runs on the ebb tide and this is a key consideration for us. The Chief Umpire and I have a lengthy discussion about it and then a further long talk with the PLA. It is agreed that the automated system has been triggered by a transient overnight rise in levels at the measurement point, that the levels were now dropping and we were good to go ahead. The final problem was with our timing system. The event was using a new computerised system for timing this year and it suffered a complete failure on the day, meaning we had to roll-back to the hand watches and re-construct the times. Unfortunately, after the provisional times were published we realised that the start and finish watches were a minute out of synch. Identifying and resolving this and the many individual queries which it understandably raised proved to be a time-consuming effort. As a consequence, the final results were published unacceptably late and as a committee we are well aware that we did not reach the standard we expect of ourselves. We certainly have plenty to think about and improve for next year. 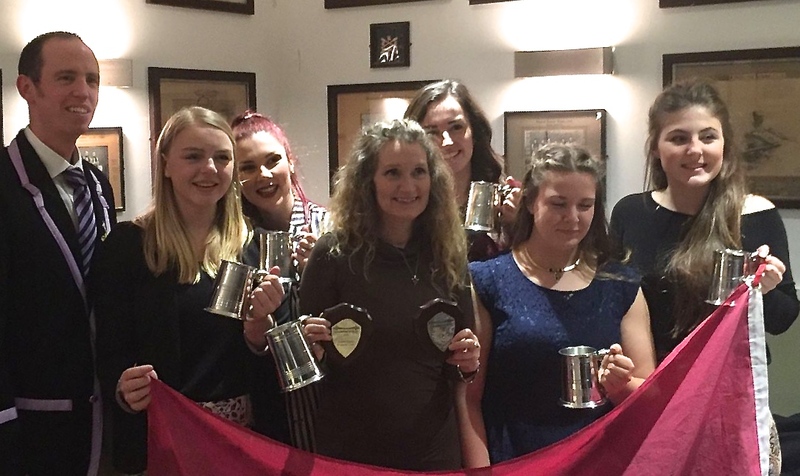 The object of the exercise – some prizewinners from Maidstone Invicta.